Once again, for the 8th consecutive year, USA semipro American football players from the North East region voluntarily shared their sportsmanship, experience and cultural camaraderie with the Costa Ricans. This year the annual Tropic Bowl was held on Saturday, May 19th at Estadio Municipal de San Joaquin de Flores in Heredia. The all-day event is recognized as the most popular American football occasion of the year in Costa Rica attracting all ages to participate in a variety of football related activities. The morning began with the children, youth, women’s football fundamentals clinic and the youth football scrimmage (San Jose Titans F.A. vs Codea Falcons Football) proceeded the clinic and the women’s game (San Jose Goddesses CR F.A. vs Perez Zeledon Southern All Stars, a combination of players from the Valkirias F.A. and Warriors F.A. teams) rounded out the preliminary activities. The featured Tropic Bowl game challenged the USA North East All Stars against the Costa Rican All Stars. Each year the Costa Rican players look forward to the annual game after closing-out the National Championship calendar. QB Joshua Rhodes #51 threw a fade pass to WR Nelson Montas #17 for the final touchdown of the game. “ This Tropic Bowl was my first invitation, it was truly a once and a life time experience. I was proud to represent my team and country in an international football game. The game against the Costa Rica team was a great experience. They scored first! With the hot temperature and working the event earlier with the children it became apparent I was feeling the heat, so I knew the team was and it would affect our play as a team. The game ended in a tie, but honestly both teams are winners. They showed up and came to play. Showing us team Costa Rica is getting better every year. We win cause of the children and fans! The San Jose Titans F.A. won over the Codea Falcons Football team from Alajuela by a 18-12 final score. Women's American Football Teams Participating In Tropic Bowl 8 - PZ SOUTHERN ALL STARS (VALKIRIAS & WARRIORS) vs SJ GODDESSES CR F.A. This Tropic Bowl was not the first time Amador won MVP. She won MVP in the premier exhibition women’s game of Costa Rica at Tropic Bowl V. She is accredited with being the 1st woman in the history of Costa Rica to score a touchdown that also led the team to a win. As MVP of the women’s game Amador received the helmet donated by Xenith. For several years Xenith has been sponsoring the MVP awards of Tropic Bowl. The children, youth, women’s football fundamentals clinic started with warm-ups and progressed to footwork drills and position stations. Youth ranging in ages from 8 - 11 years living in the areas of La Laguna Paraiso, Cartago and Llanos de Santa Lucia Paraiso, Cartago from the PIRATAS de Paraiso Flag Football team played against the youth of the Codea FALCONS Flag Football team representing, Alajuela. The PIRATAS won the game with a shut-out final score. Established in 2012, Athletes Without Borders, Inc. (AWB) is a nonprofit organization dedicated to providing youth with the proper resources and mentoring needed to empower them to cultivate healthy lifestyles. Our programs use athletics as a vehicle to not only introduce the skills and dedication needed to face the growing number of challenges within their daily lives, but also to assist in their development as well-rounded individuals. Working in partnership with local and national sports organizations, AWB serves as a resource and an advocate for the thousands of participating youth in our partner cities, villages and towns both domestically and abroad. Saturday, May 18th, 2019 has already been determined as the date for the ninth edition of TROPIC BOWL. 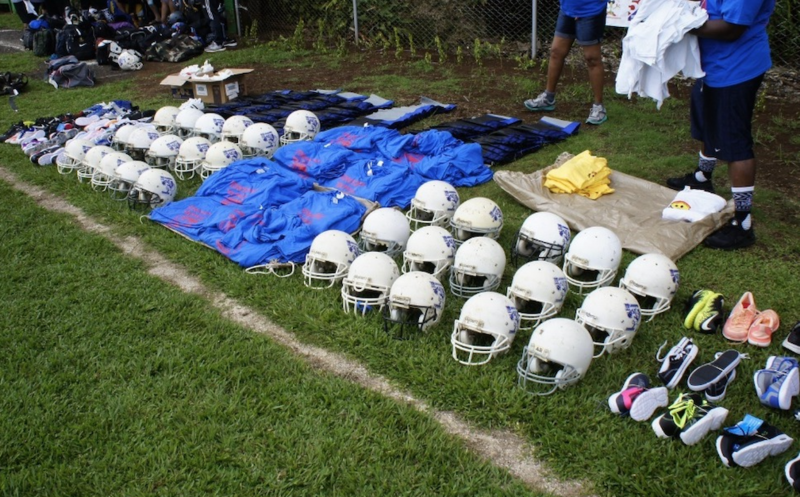 The Costa Rica league was very grateful to receive 50 youth helmets from USA, Richard Bachand to help develop the youth category. Each year the Tropic Bowl organizers provide participation t-shirts, donated cleats and other gifts are distributed to the youth attending the event.